Most people receive their starter kit and immediately start diffusing their favorite scents. It takes a couple of months to get into a rhythm of topically applying the oils and receiving the benefits they offer, both seen and unseen. But a lot of parents have shared hesitation in using the oils with and on their children. I don't have kiddos yet but have lots of friends who oil that do - and they talk all the time about how much their kids love EO's just as much as they do, and share the ways their children need them too, just like we do. Whether they've scraped their knee, have a runny nose, can't seem to settle down, have a grumpy attitude, or won't go down at night - yep, you guessed it - there's an oil for it. Remember to always consult a health professional before administering oils in any case. NOTE : Be sure to always dilute oils with a carrier oil like Jojoba, Almond, Olive, or Coconut Oil when using them on your children, especially for the first time. Perform a spot test on your child’s arm or leg. If no reaction occurs after several minutes, the oil is probably okay to use. If redness does occur, it's often due to the child having sensitive skin or because the oils are doing their job and pulling toxins from the surface of the skin. Follow Young Living's dilution instructions below. Boo-boos are bound to happen, and when they do, applying a drop of Lavender and Frankincense (diluted with a carrier oil) will not only support healing, but help to calm your child down. Developing a structured bedtime routine is so important for kids to wind down at night. After rolling Lavender on their feet, spend about 10-15 minutes doing a calming activity with your children like reading a book or listening to some calming music. If they're complaining about discomfort in their tummy, roll some diluted Digize or TummyGize onto their bellies for supportive relief. 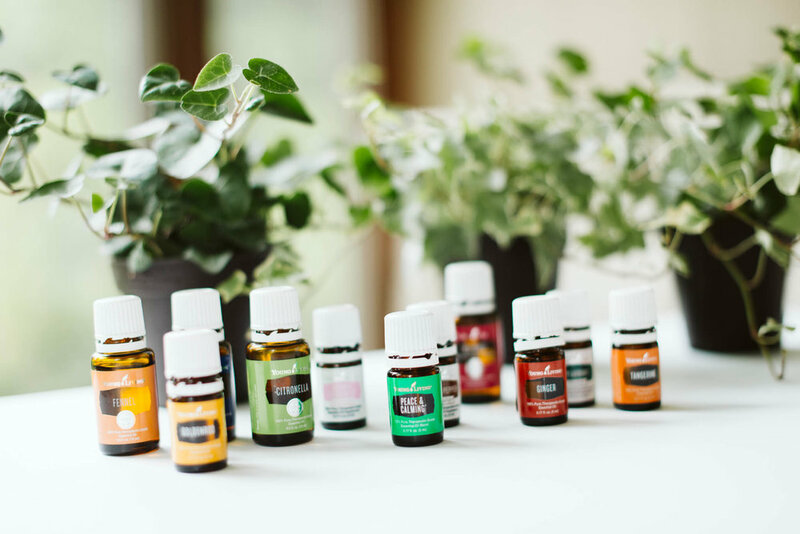 To avoid sensitive little noses, diffuse 1-2 drops of Eucalyptus, or RC oil (not Raven for children under 6 years of age) near play areas or cribs, or apply the same oils diluted in a roller onto your kid's chest or bottoms of their feet. Lastly, don't forget to try oils from the KidScents line - specially formulated just for them! Kids will start to get excited about using the oils and develop their own little routine with them. Many of my friends talk about how their kids ask for their rollers and apply them during the day all by themselves. A blend of Lemon, Frankincense, and Thieves is great to roll before school for immunity support! Nighttime is especially important for winding them down so they aren't going directly from high-energy playtime to bedtime, and Lavender is an amazing support of this time of day. It's so important to add oils into your kid's daily routine, even at a very young age. If you do, let me know how it goes! 1. WAKE UP BLEND: 8 drops of Citrus Fresh and 2 drops of Peppermint // Waking up for school can be tough but this blend is energizing and invigorating for not just them - for you too. 3. STUDY TIME BLEND: 5 drops of Bergamot, 3 drops of Lavender, and 2 drops of Stress Away // Diffuse this at the homework table or in their rooms while they're studying for a calming environment that will also help them concentrate. Add a couple drops of Peppermint if they're also feeling a little groggy after school for added focus-boosting. 4. PLAYTIME BLEND: 3 drops of Grapefruit, 3 drops of Lemon, 3 drops of Bergamot, and 1 drop of Cedarwood // This is a great blend to diffuse on Family Night too, not just during your kiddo's playtime. Whether you're reading a book together, starting a craft, or they're just playing with blocks and trucks, this grounding yet fun and fresh blend is great to diffuse in the playroom. 5. GRUMPY BLEND: 3 drops of Orange, 2 drops of Bergamot, 2 drops of Grapefruit, 2 drops of Lime, and 1 drop of Eucalyptus or Wintergreen // Sometimes it's hard to know why they're in such a bad mood but to brighten up their day, use this uplifting aroma blend - citrusy with a touch of mint. Especially paired with a healthy snack, this is a great mood-boosting go-to. 6. SWEET DREAMS BLEND: 4 drops of Lavender, 2 drops of Cedarwood, 2 drops of Vetiver, and 2 drops of Geranium // This will lure them right into dreamland, especially paired with a consistent bedtime routine. You can also try the KidScentss SleepyIze blend that features Lavender, Roman Chamomile, and Tangerine oils. While scrolling Facebook, I noticed my neighbor's post about how her 2 1/2 year old daughter was having trouble winding down and sleeping soundly through the night. I quickly suggested applying Lavender on her little one's feet at bedtime, so she popped over to pick up some oil from me. I of course diluted it for her since her little one is so young. I received a text this morning that said, "We actually slept! She woke up once through the night but quickly went back down..." Yay! Imagine what a routine of using it will do, and diffusing Lavender in the bedroom through the night. I was also visiting friends a few weeks ago and their 2 year old son was having trouble wanting to stay in bed when they put him down. I happened to have Lavender with me and again, suggested they apply some to his feet. They took him up to his bed and before they were even back down the steps, he'd stopped crying and was on his way to dreamland. I'm telling you - it works!